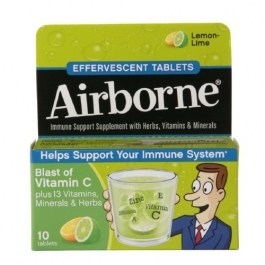 Developed by a school teacher who was sick of getting sick in the classroom. It can be taken 2 ways: at the first sign of a cold symptom, or before entering crowded, potentially germ-infested places like airplanes and offices. Offers maximum vitamin and herbal support for hours. Plus it contains natural ginger for nausea. At the FIRST sign of a cold symptom, simply drop 1 Airborne tablet in a small amount of plain water, let dissolve (about 1 minute) and drink. Repeat every 3 hours as necessary. Children: 1/2 tablet. As with all dietary supplements, pregnant or women or people on medication should consult physician before taking. May be used in hot or cold water.